So I had to brave the Bloom grocery store with both girls late yesterday afternoon. This is never a pleasant experience, as my girls tend to be cranky between waking up from naptime and dinner. Going to the grocery with Natalie and Michaela Byrd is about as much fun as being water boarded. If the President objects to water boarding, he should seriously consider forcing terrorists to go grocery shopping (at Wal-Mart!) with a preschooler and a toddler. I bet the terror warning level would go way down after word gets out. threatening Natalie to get her to get off of her sister, strapping a wailing Michaela Byrd in and out of the "car," repeatedly announcing that I did not have any snacks, and putting candy bars lifted by sticky-fingered toddlers back on the display, I was at my wits' end! I pushed my Healthy Meals goal to the back of my mind and just started chucking Weight Watchers meals and Lean Cuisines into the cart in an effort to exit the premises before they put our faces on a Wanted poster. Since T was working late, I fed the girls a quick meal (they ate better than I did!) and I pulled this out of the freezer. 5 grams of fat in a whole meal? I could dig that! Until I looked at the ingredient list on the side of the packaging! That thing is longer than the tax code and the stimulus bill put together! Ingredients like Ferric Orthophosphate and Thiamine Mononitrate don't sound so appetizing. But I cooked it anyways because a girl's gotta eat. If you like crunchy rice and enchilada sauce that tastes specifically like the hollandaise they serve on the chicken and shrimp, then this meal is for you. 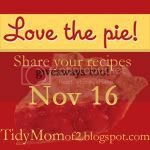 I decided to dig up a recipe that my friend KMG shared with my MOPS group last year for our fundraiser cookbook. It might have more than 5 grams of fat, but at least I can tailor it to fit our needs if I will PLAN AHEAD!!! If you no habla español, that means fabulous chicken enchiladas! *I like to add a can of the Mexican style diced tomatoes! Preheat oven to 350 degrees F. In a small bowl, mix soup and sour cream. Set aside. Melt butter in a saucepan over med. heat. Add onion and chili powder. Sauté until tender. Stir in chicken, chili peppers, and 2 T. of the soup mixture and stir until heated through. (I'd add in my tomatoes now) Spread 1/2 cup of the soup mixture on the bottom of a 9x13 baking dish. Spoon 1/4 cup chicken mixture onto each tortilla. Roll tortillas and place seam side down in the baking dish. Cover with remaining soup mixture and sprinkle with cheese. (You could even add some Pace chunky salsa to the top!). Bake for 25 minutes or until bubbly and lightly browned. I lifted this photo off of Google images so you could get an idea of what they might look like. These would be muy fabuloso at a 4th of July gathering...if you have one of those casserole carriers that keeps dishes hot, grab it and go! Remember, Ferric Orthophosphate and Thiamine Mononitrate are optional! 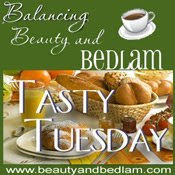 Go see Jen at Balancing Beauty and Bedlam today for more great recipes! Rhoda at Southern Hospitality is hosting a blog party today. 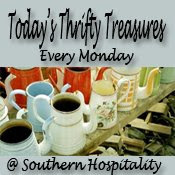 Go visit her for more of the weekend's thrifty finds! She's always so much fun. I was a little bummed about not having anything to share with you all today... Until I peeked over our back fence yesterday afternoon. Long story short, our neighbors were forced to move, and they left a lot (understatement of the century) of JUNK behind. Most of what didn't sell at their yard sale a month ago was left sitting to rot on the front lawn....ewww! It has been such an embarrassing eyesore for our street. People slow down when they drive by, and it's not because of the paint job on the old siding! When I peeked over the fence yesterday, I wasn't sure what I'd find, but I did see one item that I thought might be worth salvaging. A neighbor informed me that the "demo" crew will arrive this morning to begin trashing the entire house so it can be revamped and sold. "Take whatever you want because it will all be gone on Monday morning." she said. So I turned into a looter today. At first I felt like a criminal, but I reminded myself that everything is headed to the dump anyways, so I better find something salvageable. Disclaimer: These photos are not for the faint of heart. This house was pretty beat up...code blue! This is a shot of their front yard. Not pictured: the pile of old clothes to the far left...has been sitting there for a month now. I couldn't move it because D didn't move out until a few days ago! This is the heinous site that greeted me when I rounded the corner to check out the backyard. I have never seen something so awful. Ever! Now I believe T when he claimed the locksmith said it was "top 5, one of the worst he's ever seen." Apparently, even the Realtor was appalled. There were so many soggy boxes, wet and rotting books, magazines, shoes, etc. It was all there was to walk on. Sadly, the wicker chair and the matching love seat were covered in mold. I wouldn't touch them with a ten foot pole, and I was glad I chose to wear tennis shoes and jeans. This is the far side of the back yard, closest to our back yard. I have never been so glad that they had a privacy fence! I would have liked to take a look at the plastic lawn chairs, but I was seriously afraid that I'd get bitten by a snake! T was unwilling to help me carry it over to our house when I called him at work. Then I threatened to TiVo a Lifetime Movie instead of his soccer game, and he came around. PLEASE, I'D LOVE SUGGESTIONS ON WHAT COLOR TO PAINT IT!!! At one time, in a past life, I believe it was painted black because I could see traces of the color on the table top. They had boarded up their windows with Styrofoam!!! In the left corner, you can see part of the two tomato cages I picked up, along with some waist-high scrolly metal fencing that can be used as a trellis. When I peeked in another window, I could see the kitchen had doors missing from cabinets, no appliances, flooring ripped up, flies buzzing, etc. T went in the other day when the locksmith was there, and he told me that there were only two rooms with flooring (it was exposed sub floors), NO drywall, and the stench (from 10 ferrets, 4 dogs, and a cat) was overwhelming. I don't know how they lived that way!!! It was her father's house, and I can't imagine treating my parents' property that way. This is their front yard flower bed turned vegetable garden. I loaded up the white "picket fence" pieces that weren't broken to use as a border for my back yard vegetable garden. The leftovers will be used to make a cute "faux" fence in front of the girls' play house. Natalie and Michaela Byrd's little red wagon multi-tasks nicely! It just needs a "power washing," but I liked this outdoor mat because of the fleur de lis pattern. Here's the table in our backyard. T put it on a spot that needs to be reworked with grass seeds for now. This will be a good spot to work on beautifying it! I think it can seat 6! I do believe it looks better already. A change of scenery will do her good! I thought it might help if you could see what we have going on in the back yard for suggestions for the picnic table. Our siding (the addition is all siding and the rest of the house is brick on the bottom and siding on the top) is a khaki color. I am praying that T will start our deck to the right of the addition this summer. I'm dying for a place to entertain outdoors. I think we'll keep the picnic table under the trees though. This is the girls' play house, which needs to be cleaned up again. We've been reseeding some grass, so there are some displaced birdfeeders, and stuff is moved around. So I'd say I had a pretty thrifty day! I am praying that the company that bought the house will do a great job fixing it up and we'll get some fabulous new neighbors! My hope is that they'll get some nice vinyl siding in an updated color that will compliment the home, which is spacious and open when not gutted and forlorn. I felt like a criminal going through all their old stuff, but I think it was criminal to leave their home that way! This week's Thrifty Thursday: It's Chic to Be Cheap post detailed a few ideas for activities to keep your kids busy this summer without breaking the bank. I had some great responses that sparked some more thoughts, so I thought I'd share them today. If you have any more insight, please feel free to leave a message in the Comments area so other readers can find inspiration to make their summer at home with little ones more manageable! Prof en Retraite from the Confessions of a Plate Addict blog said she took her own grandson to see Monet's Water Lilies this week. I hadn't even thought of the art museum. The National Gallery of Art is my favorite, next to the Louvre, of course. Kids who love to paint and draw would probably have a blast examining paintings, sculptures, and other works of art. Then they can go home and create their own Rembrandt rip-off. Xazmin at This is the Year is young at heart, because she still enjoys a rousing chair spin or two. (Good for you, X!) One of the things her family enjoys is picnicking at the park or in the beautiful mountains close to where they live. If you've ever visited Xazmin's blog, you can enjoy her mountain views vicariously. To kick it up a notch, you could organize a contest for the older kids. Maybe give each of them a disposable camera, and award prizes for best nature shot, funniest photo, most creative, etc. A scavenger hunt could be fun too! My separated at birth, blonde, and prettier twin, Amanda at Imperfectly Beautiful lamented that her husband hasn't put their "ghetto pool" in yet, and the summers down South are H-O-T! We think we've got it bad here in Virginia! The picture above is similar to what I'd love to have in the back yard of my dreams, but the picture below might work for those of you who don't have a neighborhood pool, or a pool your husband hasn't had a chance to set up yet. My parents used a good old-fashioned sprinkler, sans Slip 'N Slide, and we all turned out just fine. I'm more of a pool person though...wet grass isn't my thing. I'd prefer a $10 plastic pool from Wal-Mart or Target over nothing! If you already have a gym membership, why not make use of it? This was a revelation from Becky at Farmgirl Paints. Like Becky's, the Kids Zone at our gym boasts a maze, outdoor playground, indoor play area, and computers. Some gyms may offer special summer programs, so check the website of your local haunt. I like the idea of my kiddos having some fun with new children while I get a quick workout in. Stacey from I'm a Blogger, Now What? (she's actually sort of my step-sister-in-law!) regularly visits my favorite spot--the Dollar Spot at Target. She and her kids have used some summer time to create hand-made cards to send to friends and family. Stacey noted that Target's Dollar Spot is also a great place to stock up on Superhero and Princess mini-notebooks, which are a thrill for the younger set. My sweet friend Tracy loved the Children's Book Club idea and is thinking about starting one! If it's a book that my little spitfire will sit still long enough for, we are all in, Tracy! In an exhibition of being the world's worst bloggy friend, I am just now getting around to Xazmin's tag. I'm supposed to go to my pictures, open the 1st file folder, and share the 10th picture and the story that goes along with it. Then tag 5 more people to participate! Easy peasy! This photo is of Natalie and Michaela Byrd the first time they wore matching outfits. Natalie was so excited to match her sister. This was during the brief, but happy period of time in which she enjoyed having her sister around. I call it our Renaissance. I'm linking up to Julia at Hooked on Houses for her "Hooked On..." party! Please check out her fabulous blog today. I love the way she takes readers inside all kinds of homes-from really, really bad MLS listings to celebrity homes, to homes we can find inspiration in. I haven't made much progress in the list department lately. Probably because my days have been spent doling out crackers, washing sippy cups, and switching on an Elmo video here and there so I can put on minimal make-up so as not to scare the "outside world" when we escape the house run some errands. I tend to lose lists too. I'll write up a great note detailing all sorts of things I need to work on, and then it gets lost in the caverns of my enormous purses. Or maybe they go to the same place my keys and Panera card went. At any rate, I've seen a few bloggers post their summer to-do lists, and I thought that maybe if I make my own up here, I'd be less likely to lose it. ~Make myself get out of bed early enough to get some make-up on and fix my hair before the girls wake up. It's no fun putting on mascara in front of the mirror while holding one foot on the toilet lid so Michaela Byrd doesn't decide to have another toilet party. ~Continue going through the girls' toys for stuff I can donate to Salvation Army. I have to be stealthy about this and work while they are napping or in bed for the night, otherwise there is much wailing and gnashing of teeth. I got this book a few months ago, and I keep meaning to pull it out and get started, but I can't get organized enough to do that. 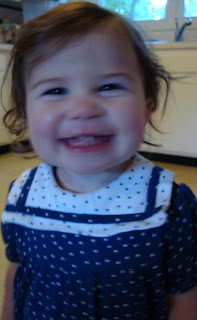 ~Start a chore/behavior chart for Natalie. The girl is killin' me here. Preschool let out for the summer, and she is wreaking havoc on the T family. I think some motivation is in order. Like most three year olds, she can be coerced with stickers, but I think she'll also enjoy the feeling of accomplishment from following through on simple things like clean-up time, putting dishes in the sink, not murdering her little sister, etc. ~Pillows to coordinate with the chair for my new craft/workspace table. ~Craft storage with some "found items" from my home. I can't wait to share this with you! ~Healthy meals. Since I hosted the GIVEAWAY for the Eat This! Not That! Supermarket Survival Guide, I keep reminding myself to sit down and make some meal plans that do not involve me standing in the aisle at the grocery frantically grabbing frozen dinners while my three year old begs for popsicles and my 17 month old attempts to escape from the cart. Finances permitting, I want to take a couple of sewing classes from my friend AT. Also on my reading list? ~The rest of Charlaine Harris' Sookie Stackhouse series. Once again, my friends L and AS have hooked me on a series of fluffy books. I love fluffy books. I read enough fancy frou-frou books in college to last me another ten years. So fluff it is! ~To the pool! We paid for it; now we need to swim for our money's worth. I'd love to get Natalie swimming by the end of the summer. Then she can forget again until next May. ~To the gym. Regularly. I really really want to take a Hip-Hop class there, but I'll need to enlist my mom for babysitting services, as it is after the girls' bedtime, and T works late on Tuesday nights. ~To bed earlier. 'Nuff said. Do you like to make lists? 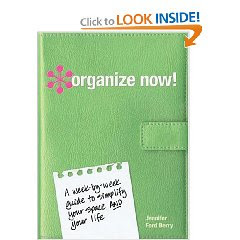 Do you lose them like I do or do you have a system for staying organized? I'd love your feedback! Have a wonderful weekend, and I hope you get everything on your to-do list crossed off! Who needs season tickets to a fancy amusement park when you can just let your kids create their own death-defying carnival rides in your living room? I was washing dishes a few evenings ago when I heard mischievous laughter coming from the other side of the Dutch door to the living room. Upon inspection, I see Michaela Byrd holding onto the old office chair for dear life as her sister spins her at top speed. So I did what any good mother would do. I grabbed my camera to document the insanity. Through the blur, Michaela Byrd is squealing with joy. Natalie was so proud that she was playing with her sister instead of pinching her. Most kids will tire of chair spinning after an hour or five, so it's always good to have some fun and ChEaP alternatives to keep them busy in the summer. I myself am looking for some ways to keep from having to chant "Serenity Now" repeatedly to myself, so this article is written selfishly. Hope that's okay with you. 1. Library/Bookstore Story Time- our libraries and local Borders each offer storytimes for children each week. Natalie is beginning to look forward to Thursday mornings because she knows we'll get to hear a story or two, maybe see a short movie, and sing some songs with other children. I think it reminds her of preschool. Michaela Byrd likes saying "hi" to everyone while the librarian is reading. 2. Vacation Bible School- many churches have a free, weeklong "day camp" of sorts. We attend a large church that opens VBS to the entire community. Last count was around 800 attendees for this week. Churches provide snacks, crafts, sing-alongs, skits, and more. This is a wonderful way to get your kiddos out of the house for a few hours in the morning. I've been volunteering in the "Snack Shack" with two friends this week, and we've had a blast! I know my girls are having a good time in the nursery provided for the workers' kids. Natalie has a review of the snack each day, and Michaela Byrd just beams when she sees her teachers in the hallway. 3. The Great Outdoors- plan a playdate at a local park. Check your local parks & rec website for park locations. We have a park with a fabulous play ground not too far from our house. I like the shaded area and the picnic tables. Have all your friends deserted you for Myrtle Beach? Pack up your kiddos and go solo! Wear 'em out, bring 'em home for naps or some cartoons, and sit with your feet up while you relax with some lemonade. 4. There was a wonderful post over at Party Planning Mom's blog about hosting a Children's Book Club-this is clearly a better idea for older kids, but think of the themes you could come up with! My friend Tracy was born to host something like this! Get your kids together once a month to "chat" about a favorite book. They can do a craft or worksheet that corresponds to the book or theme, have a snack, and then run wild while the mamas socialize. 5. Grow a Green Thumb- it's not too late to pick up a few pots and seedlings at Wal-Mart or Lowe's. Your little gardener would probably love to help you plant and water some new marigolds. 6. Be a Brainiac- If you live near a big city, plan a trip to a museum or zoo. I love the National Zoo because admission is free. When summer winds down and the weather turns a bit cooler, I'd like to take my girls up to DC to gawk at the animals. 7. Veg Out every once in awhile- I already told you about the mistake I made when I took Natalie to the local movie theatre for a FREE movie. I won't mess that up again! Next time, I'll sneak a juice box and some crackers in for her and call it a day. The free movie offerings can be a fun way to have an easy, no planning required outing with the kids. 8. Check out the Free Craft Demos at Local Craft Stores- our Michael's and AC Moore often host free craft demos for older children. A great way for them to get their creative juices flowing! 9. Start a Play Group-Keep it informal, maybe with just one other family. Plan some snacks and games to occupy the children while you have a chance to chat with another adult. 10. Weigh Your Options- T and I decided to splurge and join the pool just down the street from us. He cashed out a week's vacation so we could pay the "stock fee" and yearly dues. We never go anywhere. Ever. Heading down to the pool is like a little vacation unto itself. So far, we've been swimming every afternoon but one, and when VBS is over we'll start visiting the pool in the mornings. We've already met some really nice people, and Natalie makes friends with every little girl who looks close to her age. Pool time has been a great behavior motivator for Natalie, who knows that she won't get to go swimming if she doesn't take a nap, acts out, etc. T and I decided that if we took a real vacation, we'd spend an awful lot more than what we spent on the pool fees. And this is something that "gives back" all summer long! Leave me a comment with your ideas, and I'll feature you in this weekend's Spend Less post! About two months ago, my car keys mysteriously disappeared. I am pretty meticulous about putting them on the key ring when I come in the house, but occasionally I'll leave them in my purse. Along with her dog water obsession and fascination with the toilet, Michaela Byrd has developed an interest in the trash can. We were playing yesterday when she toddled back into the family room. "Ta!" she said urgently. "Ta!" 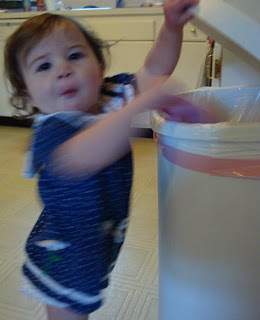 I followed her into the kitchen where she gestured at the trash can. (Oooooh, "ta." Now I gotcha.) I opened it up and saw the little pink cloth she'd been "cleaning" the coffee table with. In recent weeks, I've discovered the phone in the fridge (although I think Natalie may have had a hand in that), my TiVo remote in the trunk by the stairs (can I just tell you how panicked I was when I realized I would not be able to turn on TiVo to view my recorded episode of The Bachelorette? ), and my wallet in the dog toy box. I'd be willing to bet my keys that they ended up in the trash two months ago. But I can't stay mad at that face! I have resorted to putting the trash can up on the rarely-used portion of the counter. Do they make trash can locks? Do they make straight jackets for toddlers? Is it wrong that I really miss my Panera card? I doubt that the rats at the landfill will know what to do with it. If you see a rat at your local Panera ordering a Turkey Bacon Bravo, kindly divert his attention so I can come and pick up my card. Oh, and my keys too. Mystery solved. Elementary, my dear Watson.